Today we’d like to introduce you to Deja Osbourne. Deja, please share your story with us. How did you get to where you are today? I was a graphic designer in the fashion industry for about 10 years when I became a single mom. I made the decision to quit my job and raise my son and start my own business. I’ve wanted to have my own business since about 2007 and never quite knew what business to go into and also was too afraid to take the leap. But when I became a mom, it was something I felt I had to do now. It took a couple of years before I found something I can pursue and it was a new field for me. That was when I discovered spirituality and oracle cards. Oracle cards are decks of cards with art on them as well as a message and people use them to get messages for a specific question or for the day by channeling these messages from Spirit or the Universe. I became very intrigued by this and naturally wanted to create my own. My first deck was to manifest prosperity and success affirmation cards which included my own photography. 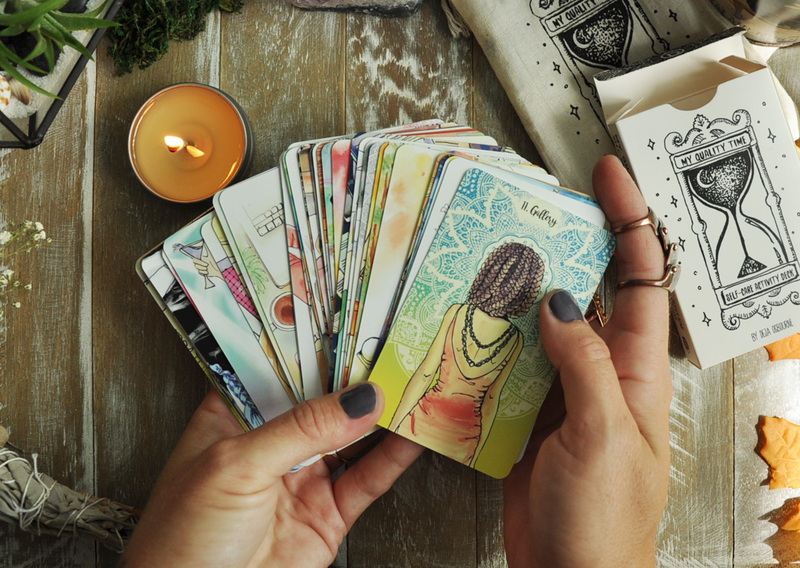 My next deck was a tool I created for myself and other mothers and hard working women. My Quality Time self-care deck. Becoming a mother has changed my life and I completely neglected myself in order to take care of my son. It took me about a year to realize that I had to take better care of myself and actually making time for it. 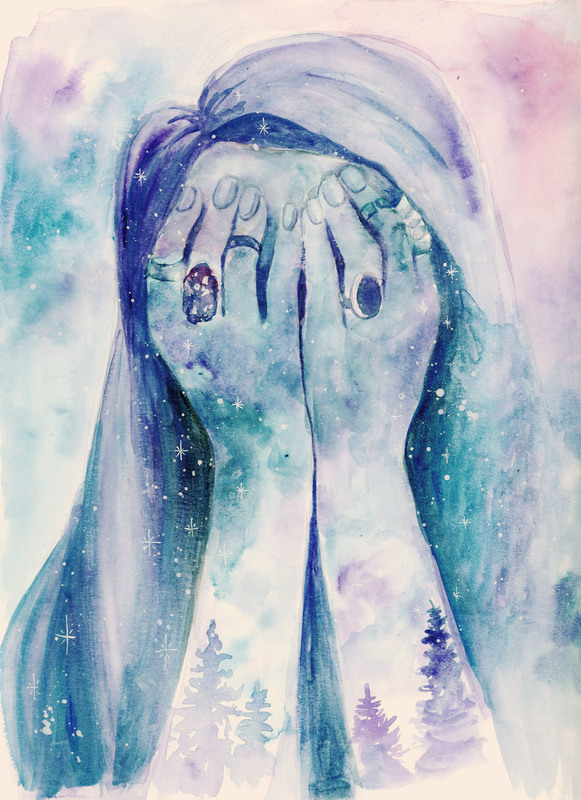 So, I created a self-care deck that includes 44 drawings and paintings with various easy and affordable (mostly free) activities that would help women stay sane and happy. After the release of this deck, I finally started earning money and putting all of my energy into growing my business. I began growing a following on Instagram, and Facebook. I was so thrilled to receive great feedback and such warm messages from other moms thanking me for creating this tool for them. 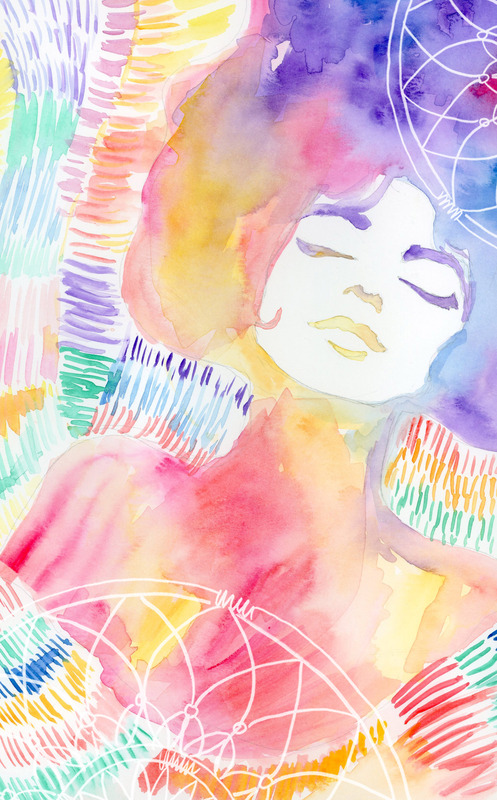 You don’t need to be spiritual to use the self-care deck. 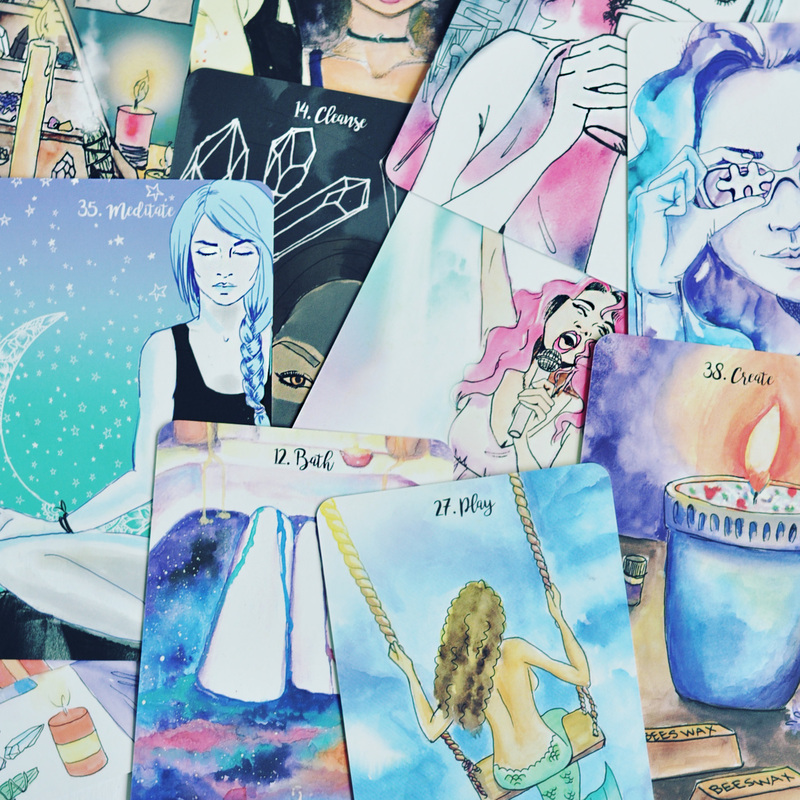 I am currently working on my third and fourth decks and am very excited that I have found a business I am passionate about, that helps people and where I can be creative. All of my card decks have 1 goal and that is to help other people. 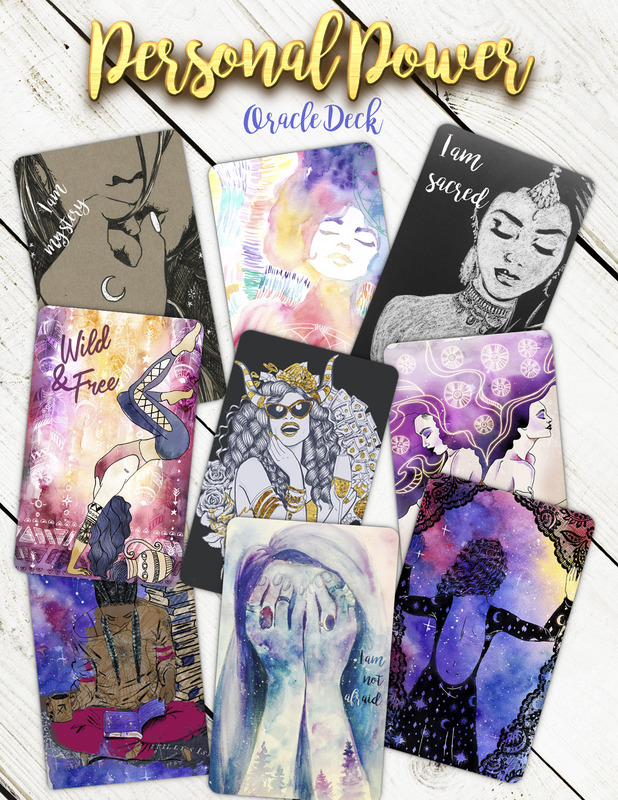 My next deck, Personal Power Oracle deck will launch in June 2018 on Kickstarter and it is to help women with self-love and self-worth. This deck was inspired by my own struggles growing up being bullied and made fun of which not only made me hate myself and my body but also traumatized me for over a decade. 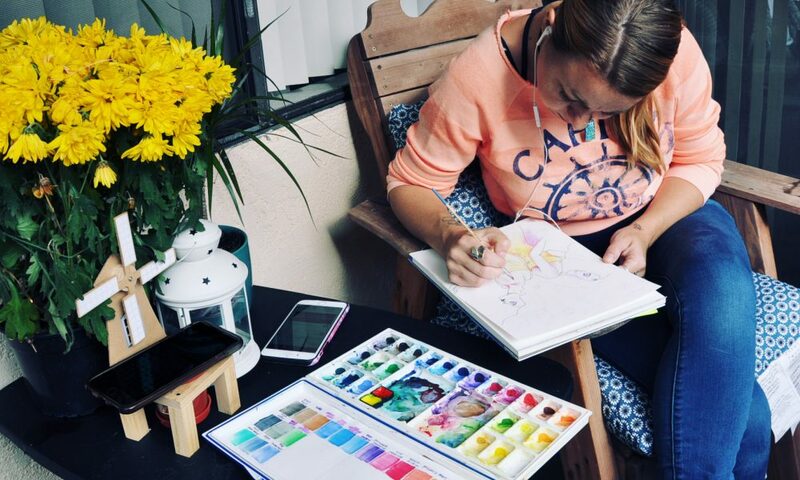 I use my own experiences to inspire my art projects and use them to try and help people. My son is 4 and a half now and it has been a very difficult journey, but I couldn’t be more proud of myself and finally have a good outlet for my art where my art is truly appreciated like never before. It has been a very rocky road. I quit my job and accumulated tons of debt, had to give up my apartment and my sanity and live with my family – we became a family of 7. There were times, my bank account was overdrawn and I had to use credit cards to buy food. There were times, I had to choose to pay my car payment over a credit card payment. I had to sacrifice that in order to bond with my son and pursue my dream of having my own business and trying to make some kind of a difference in people’s lives. To me, this is just the beginning. 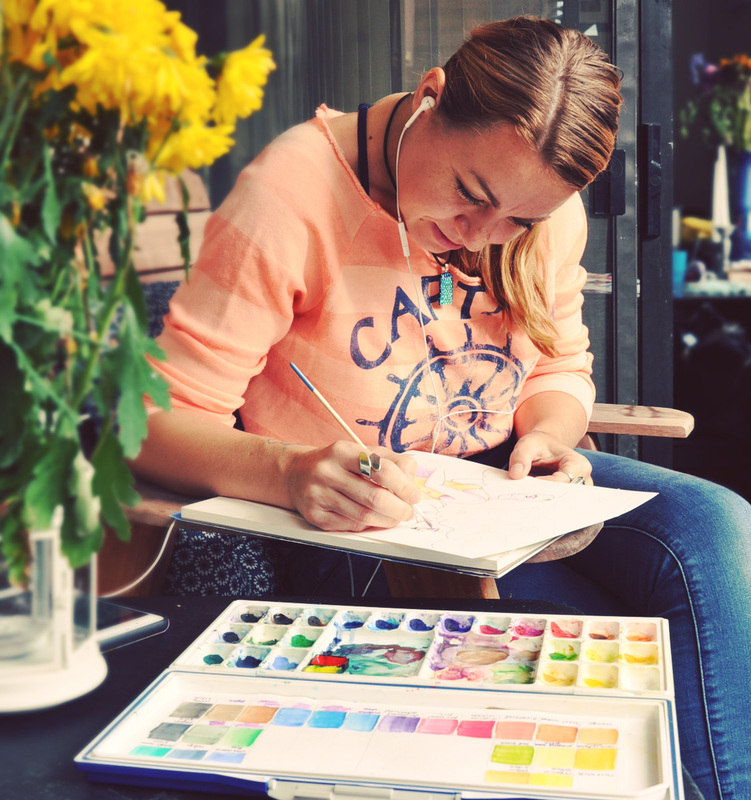 There is so much more I want to do and so many more people I want to help through my art. The biggest struggle has been having to depend on my family for financial help which came with a lot of guilt. I have always been a very determined and self-sufficient woman. I began working when I was in high school and was always so proud to pay my own bills. Becoming pregnant was not something I planned but I knew it happened for a reason and I embraced it. My son is the most beautiful gift I could ever ask for and I don’t regret my decision to quit my job even though my family did not support my decision at the time and that burden ended up falling on them. Today, they are supportive emotionally and also proud to see me slowly getting back on my feet. There was also a lot of arguing, screaming and crying where I lived for over 3 years and that motivated me to work as hard as I could to be able to get my own place again for my son’s sake and my own. We just moved out to an apartment that is nicer than I’ve ever lived in before and it feels amazing to be able to do that for my son. My life has never ever gone according to plan. My only advice is to live in the moment and follow your heart. Yes it would be smart to avoid debt and have savings but for me life always threw curve balls my way with breakups, divorces, pregnancies, job loss and so on. I just had to always have faith and know that there is always a way up that I had to just appreciate this moment, even when things were rough. Find the things you can truly be grateful for and focus on that. I know today that all the curve balls that the Universe through my way were for a reason, they were lessons, they were trying to steer me so that I can stay on my path and today, I am grateful for every single one of them. Some people are not meant to have an easy life because they have a greater purpose to help others through their experience. Your journey will be unique and different from those around you. All of my friends who had babies are married and continued to work and hire nannies or put their kids in daycare. They all thought I was crazy to pursue starting a business and refusing to let anyone care for my son. But you have to do what feels right to you and I honestly do not regret it. My son is happy and smart and we have a connection that no one can believe. I am truly grateful I get to spend time with him all day and also work on my business. So, as you know, we’re impressed with Dejadrewit.com – tell our readers more, for example, what you’re most proud of as a company and what sets you apart from others. I am an artist and graphic designer. I worked in fashion for over 10 years creating allover textile designs and t-shirt screens for women and girls. I was known for at the time for my girl illustrations that did really well at Target. Today, I continue to experiment with pencil and watercolor always challenging myself to try new things with my art. 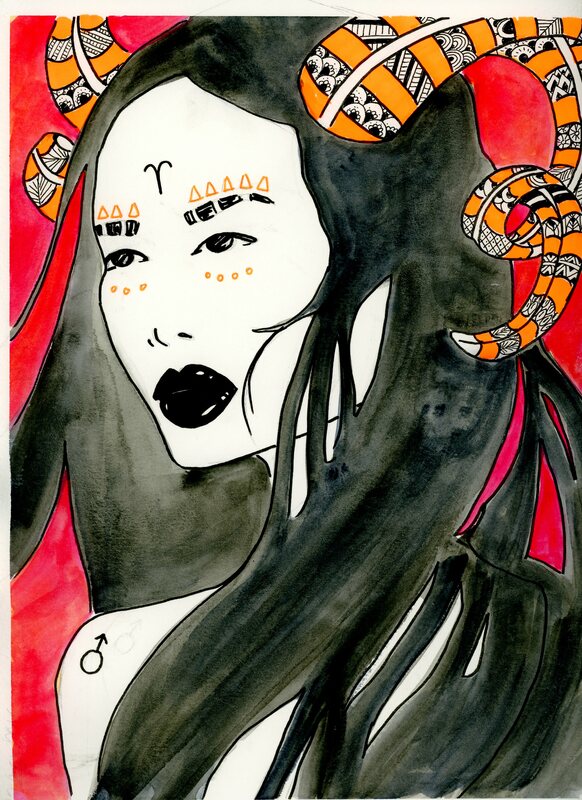 I love to draw and paint pictures of women and girls and am working on my 2nd oracle card deck that features women illustrations and paintings. What I am most proud of is that I use my personal experiences to create tools that help other people. 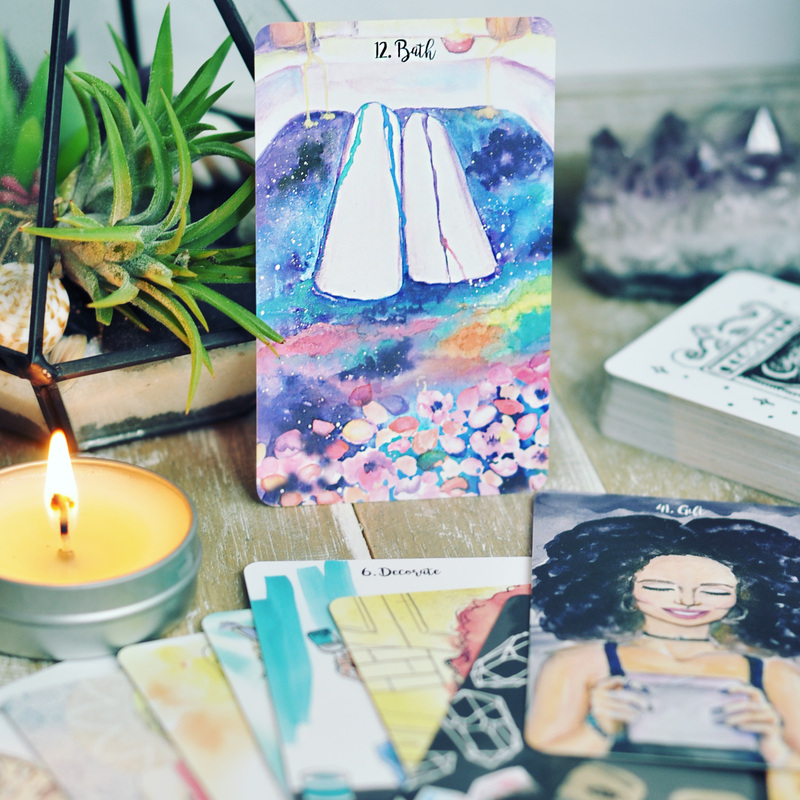 I look back at the challenges I have experienced it and try to find ways to help other people deal with the same kind of challenges using my oracle decks. I try my best to be original and usually pursue an idea if it doesn’t already exist. My main focus right now is to inspire and help women heal whether it’s from being exhausted as a mom, or for dealing with self-worth and self-esteem issues. I love creating oracle decks because anyone can use them. Oracle cards helped me heal during a breakup and that is why I believe they are a very powerful self-help tool. You can ask the cards for a message or advice. I hate to be so cliche but Oprah has inspired me because she herself had to fight against so many odds to be successful. She inspires me because she dealt with traumas as a child and many odds against her but she persevered. I also love the fact that she didn’t do what other people were telling her, she listened to her intuition and her gut and she led the way for her success and it has always been very positive and influential for people. I think it’s so important to have a good impact on people and that being your goal and not just being rich and successful. Another woman who I find very inspiring is Lisa Nichols. She also has a very similar story where she had to pull herself out of poverty, make sacrifices, work multiple jobs in order to not only provide for her and her son but to also make an impact and help people.